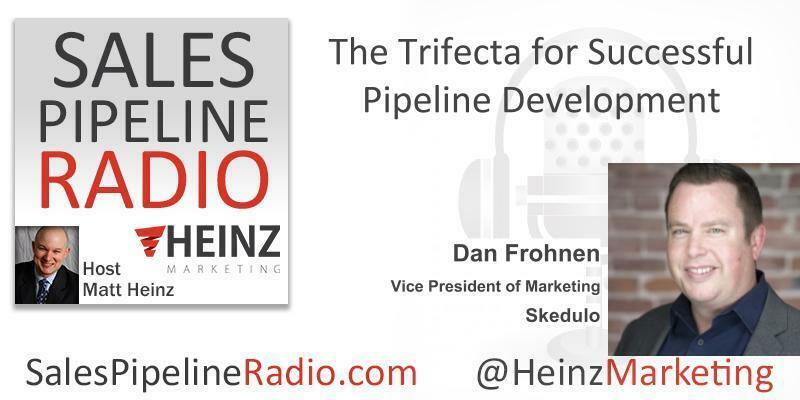 Our guest this week is Dan Frohnen, Vice President of Marketing at Skedulo. Pipeline development is not a one department job. In order to succeed in this day in age, modern marketers need to take a seat at the revenue table and own the revenue number along with their Sales peers. That means driving pipeline, owning successes and misses, and continuing to up the game to beat competitors in this noisy world we now operate in. What’s better than one team winning … three! Join Matt and Dan as they discuss steps you can take to up your pipeline game and build the ultimate trifecta. Data-driven Marketing Executive. Focused Team-Leader skilled in consistently delivering innovation, visibility, and sales for on- and off-line marketing and demand programs. Expert in building strong organizations with a 360-marketing mix / demand generation programs including market research, social media, trade shows & events, digital, direct marketing, public relations, advertising, e-mail, analysis, CRM, marketing automation, SEO / PPC, creative brainstorming, sales / market development strategy and partnerships. Passion for conceptualizing and implementing marketing strategy, exceeding targeted projections, and leading teams for both B2B & B2C programs. Strengthens organization with out-of-the-box thinking and an entrepreneurial spirit. Specialties: Large Team Leadership, Lead / Demand Generation, Problem-Solving & Optimizing, Account Based Marketing (ABM), Business / Sales Development, Strategy & Analysis, Go-To-Market Strategy, International Marketing, Tactical Execution, Marketing Mix Integration, Start-Up organization, Growth, Turn-arounds, and Operations.